1. �Five year��membership in the U.S. 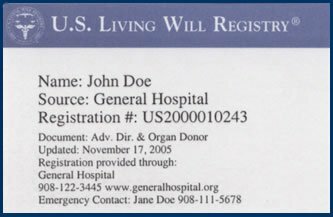 Living Will Registry (after 5 years, you can renew for another 5 years for only $25). 2.� Electronic registration of your document in the nationwide registry. 3.� Wallet card and personal Registration #. 5.� Annual update reminder so that your personal information and document remain current. 6.� Unlimited changes to your information and document. You can even email or fax a copy of your document directly from your laptop computer or smartphone.� This is a very convenient way to give your document to health care providers who will ask for it whenever you are admitted to a hospital, go to the Emergency Room or even if you have elective outpatient surgery. 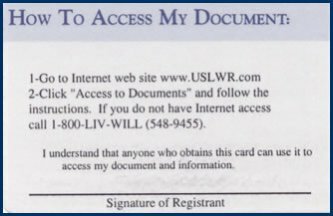 ����-�Access via Internet using your personal Registration # (wallet card). ����- Access via Internet by name and birth date search by member health care providers. 9.� �Privacy and confidentiality - your personal information is never sold or released to third parties - you do not need to "opt out". 10.� Peace of mind that your wishes will be available to health care providers whenever and wherever needed.� Your family members will not be burdened with difficult, guilt-ridden decisions about your care. Once your order has been processed, you will receive your registration packet via U.S. Mail. Will your health care choices be honored if you become incapacitated? Protect your right to control your health care. Learn how to create and register your living will and health care proxy. The United States Supreme Court guarantees you the right to make those choices, even when you are too sick to make your wishes known. This right gives you control and protects your dignity. But how can you be sure that your choices will be honored if you're incapacitated? 1. A living will is a legal document in which you state the kind of health care you want or don't want under certain circumstances. 2. A health care proxy (or durable health care power of attorney) is a legal document in which you name someone close to you to make decisions about your health care if you become incapacitated. You can have both - a health care proxy naming a person to make the decisions, and a living will to help guide that person in making the decisions. In order for your advance directive to be useful, it has to be available. After all, your advance directive won't do you any good if no one can find it. Ensure that your advance directive is available when you need it, wherever you are. Fortunately, there's an easy, secure way to make sure that your advance directive is available to your family and doctors wherever and whenever it's needed: the U.S. Advance Care Plan Registry. Developed in consultation with attorneys who represent hospitals, the U.S. Advance Care Plan Registry, powered by U.S. Living Will Registry is a nationwide service that stores your advance directive electronically and makes it available 24 hours a day to health care providers across the country. Your advance directive - living will, health care proxy, or both - is made available to your family and doctors when most needed: when you're too sick to communicate your wishes. U.S. Advance Care Plan Registry eliminates worries about carrying your advance directive with you, as well as problems of finding it should you become ill.